Before he became the President-Elect, Trump was still a blowhard and a bully. Now he has the ultimate “bully pulpit” from which to trumpet his ideas and plans and build more of his own empire. As he would tweet, SAD. Geeks to Whales: Can Devolution Be Progress? Evolutionary biology has somehow become controversial. 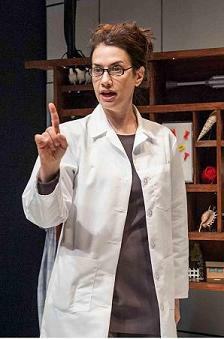 Darwinism battles creationism in “Evolution” at 59E59 Theaters through May 20th. All three women, and Minnie’s nurse Sherry, are intelligently played by Patricia Buckley, who is also the author of this funny and poignant new play. Sea mammals, as Pammy drolly lectures, can only be explained as land animals regressing back into the ocean. Minnie, whose name teases the word minnow, seems to be drawn to water. She may be a victim of devolution and the sea. 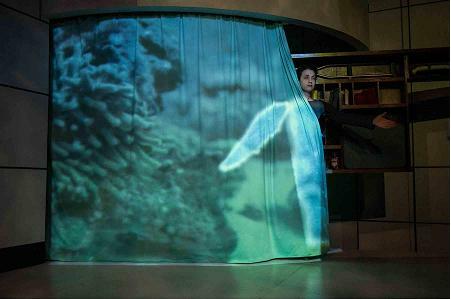 Jim Findlay’s sets and video designs for “Evolution.” project dynamic marine scenes, enhancing the production. Meanwhile, downtown on Here’s stage, the New York Neo-Futurists present “You Are In An Open Field” on Thursdays -Saturdays through May 19th. Marta (Marta Rainer) in “You Are In An Open Field” has a similar compulsion to Minne in “Evolution” for breathing under water. Marta is one of the geeks riffing on game theory in this musical slash video game entertainment. “You Are In An Open Field” is written and performed by Kevin R. Free (Kevin), Marta Rainer and Adam Smith (Adam) and Eevin Hartsough. Rounding out the cast are Steven A. French (Actor) and Cherylynn Tsushima (Dancer) who add to the air of absurdity and whimsy. Music is created by the Neo-Futurists’ frequent collaborator Carl Riehl who leads a live hip hop band. 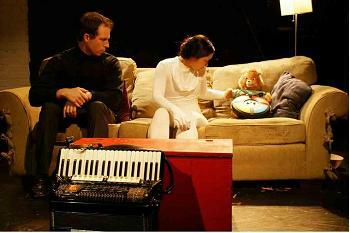 Christopher Dippel directs this off-beat and amusing theatrical event. To download tracks from the New York Neo-Futurists new musical “You Are In An Open Field” go to SoundCloud. Two songs, “I’m The Boss” and “Do It,” are available on SoundCloud at the direct link http://soundcloud.com/ny-neo-futurists/sets/music-from-you-are-in-an-open.